Dies R Us: You Are Fabulous! Greetings Dies R Us friends! Alicia here rounding up our first week in blogland. First let me say that I'm super excited to be a part of this wonderfully talented design team here at Dies R Us, and I hope that we will inspire you with our projects. So make sure that you come back and follow us regularly on this creative journey both here on the blog and also on our Facebook page. Now, for my first inspirational project I've used Sassy Studio Designs 'Effie Trinket'. I've coloured her with Copics in soft spring colours. Although I've kept the base & image shape simple, I've used 3 gorgeous dies to create my spring theme. I've used the Cheery Lyn Victorian Picket Fence die in white (and who doesn't love a white picket fence?). The cluster of flowers were created using the LaLa Land Rolled Rose die and edged with Vintage Photo Distress Ink and Kindyglitz. I've layered the cluster on top of a bright yellow Magnolia DooHickey Swirl die to bring the colours of the tulips in the background paper out. And finally, I've finished off the card with a bit of bling, being more Kindyglitz and rhinestones. Thanks for visiting our blog and I hope I've given you some inspiration or at least left you with some creative ideas to try. Please come back on Monday for Mikha's next stunning creation and be sure to look back over the other design team member's creations from this week. 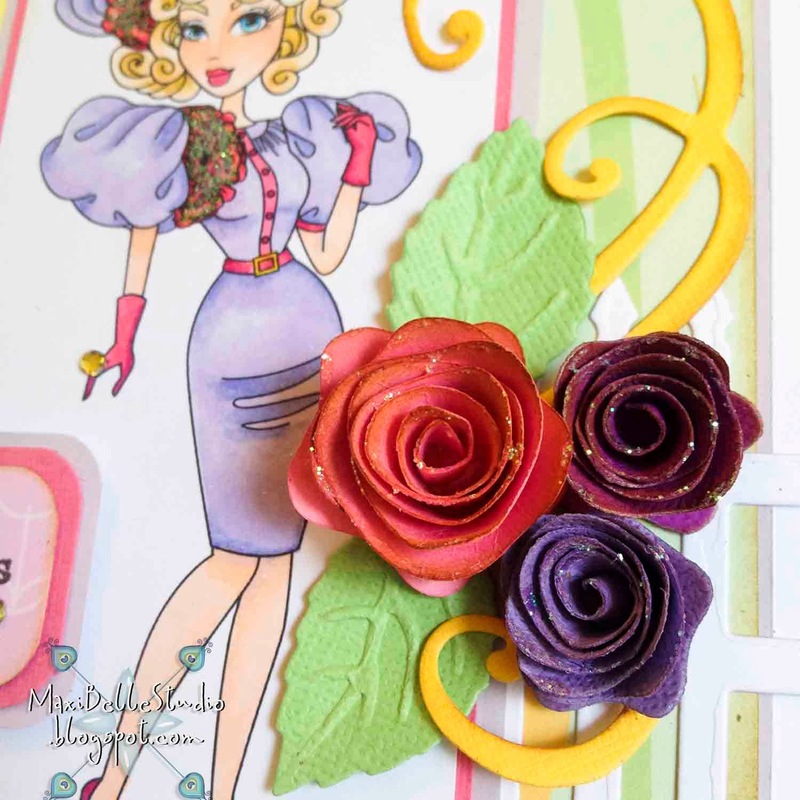 Love the bright colours that you used on the card and the La La Land roses are beautiful. Nice bright colors and like that you kept the background simple. Well done Alicia! Love how you used the dies and your coloring is very nice. Great card, Alicia! And those flowers just made the image pop! Cute image and great colors. (AND coloring!) 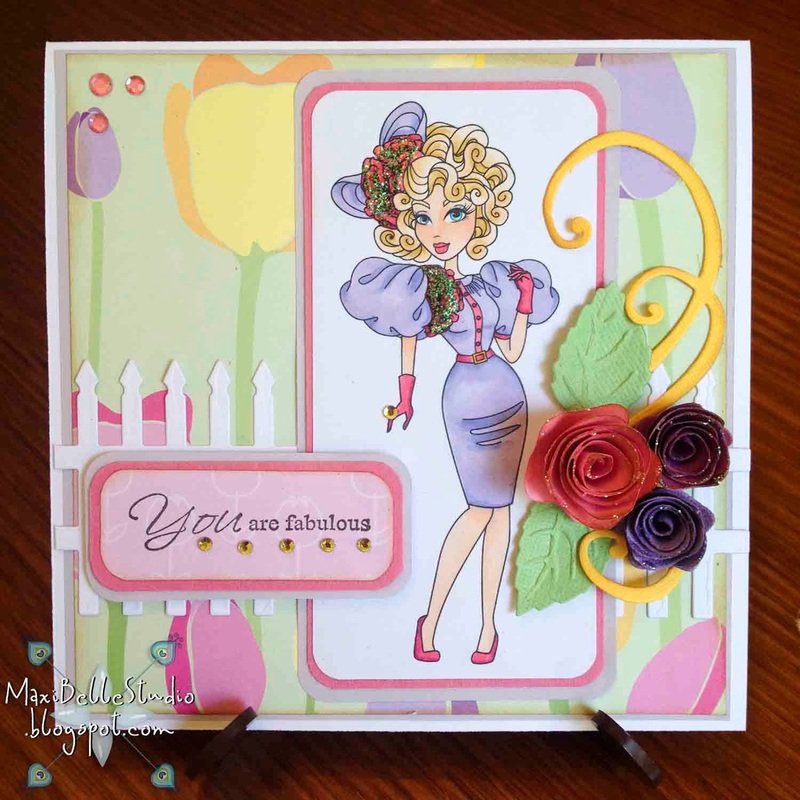 Love the flowers with glitz and the swirly die.... great card! Wow so pretty!!! Love all the great flowers you have made and added. Awesome spring card!!! This is a fresh card, very pretty !